Here’s the plot of Shane Carruth’s new film Upstream Color, for all the good it will do you: A young woman named Kris (Amy Seimetz) is kidnapped by a man named in the credits only as the Thief (Thiago Martins). The Thief has been conducting secret experiments in mind control using worms that have the power to destroy consciousness. He forces Kris to ingest the worms, wiping her memory clean and robbing her of everything she owns. Once released from the Thief’s clutches, she finds her way to a mysterious figure called the Sampler (Andrew Sensenig), who removes the parasite growing inside her and implants it into a pig he keeps on his farm. Now cut off completely from her past identity, Kris struggles to build a new life. She meets Jeff (Carruth), a businessman whose own past is riddled with strange lacunae. The flowering of the romance between Kris and Jeff is intercut with scenes of the Sampler at work, tending to his corral of pigs and conducting his own experiments with the parasites. Once Kris starts to piece together what happened to her, she sets out to restore the balance. That’s the plot, radically simplified, streamlined, and purged of the actual film’s mind-boggling complexity. Of course, “Shane Carruth” and “mind-boggling complexity” have been inextricably linked since he appeared out of nowhere with Primer in 2004. A former engineer and a fearsome autodidact, Carruth taught himself every aspect of filmmaking and wrote, directed, produced, shot, edited, and scored his debut on a shoestring budget. (He also played one of the two leads.) The story of two young inventors who accidentally discover time travel, Primer was hard to fully grasp on first viewing, but it was so smart and stylish that many were happy to go back for repeat visits to unlock its enigmas—it was a puzzle that invited you to solve it. And once the intricacies of its time-looping narrative structure were deciphered, and character motivations became clear, the movie stood revealed as a thematically ambitious and psychologically acute study of egotism, ethics, and the conflict between friendship and ambition in a capitalist world. 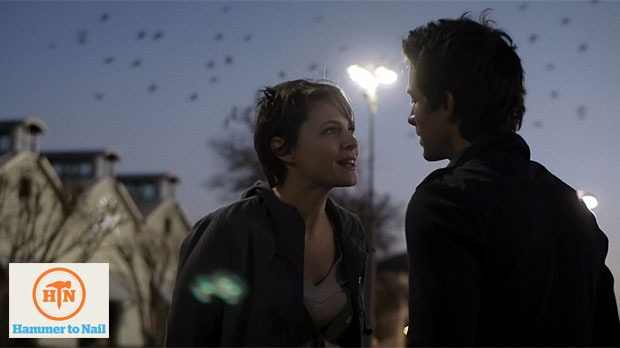 Upstream Color is no less of a head-scratcher, but it operates on a more abstract, intuitive level. First and foremost, the film is an extraordinary sensory experience. Its texture is slippery and dreamlike: shimmering, shallow-focus, artfully opaque images; a lyrical, free-associative editing style that skips around in time and space and renders events as half-glimpsed, fleeting impressions; a soundtrack of unearthly electronic hums and throbs. After watching it twice, I’m still baffled by significant portions of the story, but perhaps cracking its narrative code is less important than letting its waves of image and sound wash over you, and opening yourself up to the way certain moments resonate as potent metaphors for familiar emotions and experiences. There’s the aching depiction of trauma and loss suffered by Kris when she loses her home, her job, and her sense of self. And later in the film, as Kris and Jeff grow close, they discover that their memories from childhood have become jumbled together; story-wise, the scene is there to suggest that they’ve both been victims of the same crime, but it also reads as a lovely and haunting evocation of how being part of a couple can blur the boundaries of individual personality. I raised these points with Carruth when I spoke with him at his publicist’s office in downtown Manhattan, a few days before the movie began its New York theatrical run. Shane Carruth: There’s a lot going on between Kris and Jeff that they don’t know, but we know that they are somehow connected or affected by what’s going on in the pig corral. And so to me, that makes all of their interactions interesting, because when they’re attracted [to] or repelled from each other, there’s no way [for them] to know what to attribute that to. And the shared-memories thing—from a plot perspective, there’s a communal experience happening, there’s a weird, at-a-distance, psychic thing happening. But at the same time, all of their interactions could still play out that way if we didn’t know about these otherworldly or genre elements. In a relationship—not that people have shared memories, but there is this difficulty in that what starts as fun and light, this idea of, Where do I end and where do you begin?—it can become antagonistic when it’s a loss of self or loss of identity because you’re so mixed with somebody else. So it just seems like we’ve got opportunities to have scenes that would take place in any real circumstance, and yet we are attributing them to potentially being affected by what’s going on way, way over there. And if we do that successfully, then it makes the exploration hopefully universal. Carruth: I was becoming more and more interested in personal narrative and how it shapes our actions, or how our actions shape it. As a thought-experiment, I wanted to strip somebody of that and force them to re-grow it, from potentially the wrong information, and they would have to live out this other narrative that didn’t quite fit. I originally thought, well, if you took all this away, you would have this core, and that would be this person, and they would grow up [into] a new thing but they would still have this core. The thing is, the more I played with it, the more I started to feel like if you start taking away all these things, there’s a real chance there isn’t a core, there isn’t anything underneath it, and we really are just the accumulation of our subjective experiences. And that got really horrifying. And that’s what led to a lot of the story. Just from a plot-mechanics perspective, I needed to make up a way to do this, to break people down and have them build their narrative back up, and that in my mind needed to fit some criteria. I wanted to embed it in nature, in our own environment, and [I wanted it to be] something that’s cyclical, that’s always been around. So that’s where the whole life-cycle thing came from. I didn’t want to use some device—for instance, it could’ve been done with amnesia, or a pharmaceutical drug—but if it was too specific, then it becomes a story about a pharmaceutical drug, or a story about a certain medical condition. So it needed to be more universal than that, because it’s aspiring to talk about all the ways that we can feel like our path is affected by faraway things. “Something that’s cyclical, that’s always been around,” something “universal”—as these words suggest, there are science-fictional, even quasi-mystical, aspects to the story. Carruth intercuts images of microorganisms multiplying, fluids moving through bloodstreams, lifeforms dying and giving birth to others, that imply the parasite may be part of some larger cycle in nature, one that may even predate the human species. (Parts of the film’s montage evoke the cosmic scale of 2001 and The Tree of Life.) Here, again, the film presents a challenge: most sci-fi movies, Primer included, orient the viewer by establishing a set of rules that govern how their fictional worlds operate. The world of Upstream Color has been imagined in exceptionally precise detail, yet still resists our attempts at understanding, like a lock with a key that won’t quite turn. No doubt in the months to come, as the hive-mind of the Internet sets to work on it, some mysteries will be unpacked, but there are connections—particularly those relating to the exact nature of the parasite and how its powers are harnessed by various players—that may never be fully explained. That said, if you go with the flow of the film, which I most certainly did, the process of teasing out these connections is more pleasurable than off-putting. My first time watching it, I thought that the Thief and the Sampler, along with a mother-daughter team of orchid harvesters who are helping to spread the parasites around the world, were agents in a vast conspiracy. The second time around, it struck me as more likely that each of them was operating independently, presumably oblivious to the discoveries and machinations of all the others. Carruth: That was my intention, yeah. You use the word conspiracy —— I didn’t want it to seem like that, ‘cause that says something about somebody managing it, whether good or bad or whatever, and [what I intended was that] each of them is performing their own little tricks in nature without knowing or caring who’s next in line. That to me suggests that it’s cyclical, it’s been around a long time, it carries forward of its own volition, not because anybody wants it to carry forward—and that it’s universal. Carruth: [The Sampler] was meant to be a real contrast to both the Thief and the orchid harvesters. The Thief is a bad guy, and the orchid harvesters—they look like they’re at peace with nature, they’re doing only benign things. But the only thing we really see the Sampler do is de-worm Kris, but then also sample or observe—he only observes. So the idea that Kris would find him culpable, to deduce that he’s the guy that she’s got to go and get, was for me a way to resolve my story without pretending like it’s a morality tale—it’s a final version of the whole movie, basically, where she’s just supplanted one narrative for another. And even though she’s having an emotionally resolved arc, the text of it is probably not a happy ending. Carruth: I need to stop being the guy who’s getting rid of weird digital glitches or learning the software at 2 in the morning—I’ve got to let go of some of the mechanics of this. But I’m gonna be even more of a control freak [in every other respect]. I was playing with the idea of not, but I’m over that now.